Hopfen: Herkules Malz: Weizen-, Wiener, Rauch-, Karamellmalz Classic smoked beers tend to have an extremely dominant smoked taste, which is often regarded as overpowering. 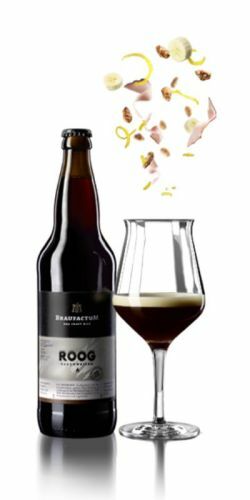 With Roog, a smoked unfiltered wheat beer, the smoky note has been toned down while preserving the distinctive character of this kind of beer. The threeway combination of smoked beer, wheat beer and special malt aromas comes together in perfect harmony. Das klassische Rauchbier weist einen sehr dominanten Rauchgeschmack auf, der oft als zu dominant empfunden wird. Roog, heftrübes Rauchweizen, hat die Rauchnote entschärft, ohne dem Bier jedoch die Rauchbier-typischen Charakteristika zu nehmen. Der Dreiklang aus Rauch- und Weizenbier sowie Spezialmalzaromen ist harmonisch abgestimmt. Clear reddish brown amber colour, white head. Smoky aroma, wheat, malts. Sweet malty flavour, smoke. Smoky finish, light banana. Bottle, shared with Inbreak and friends. Pours cloudy maroon, with a big creamy, off white head. Aroma is sweet malty notes of bread, peppery wheaty notes, smoky bacon and hay. Medium body, with soft carbonation. Flavour is peppery wheat, chocolate, bread and hay. Bottle. Color: Ruby, beige head. Aroma: Wheat, caramel, hints of smoke. Tadte: Wheat, notes of caramel and nice notes of smoke, hints of yeast. Moderate sweet and bitter, slightly sour. Somewhat more bittery finish. Smooth mouthfeel. Medium body, just below average carbonation. Pretty good. 12.04.2018 -- 0,65l bottle from braufactum shelf in marktkauf, 6.99€. pours an opaque deep chestnut with a steady beige head. aroma of caramel malts, prunes, slight ham and raw potato. flavour of plum juice, dried figs, nuts, just a hint of banana. prickly carbonation. I'm not usually a fan of smoked beers, but this one is quite mildly smoked. not too much banana either, but weizen vibe is recognisable through general fruitiness. easily drinkable. Bottle. Murky brown with a beige head. Smoke, banana, toffee, caramel, brown sugar and yeast in aroma. A bit like a smoked cake actually. Roasted malt flavour with smoke, some odd spiciness, salt and a decently bitter finish. Tastes like more of an experimental brew than a regular. UPDATED: JAN 23, 2018 Clear brown with a tan head. Aroma is smoked and malty. Taste is caramel, nuts and smoked ham. Aroma of toasted malts, bacon, maple sugar, molasses, and blackberry. Taste is wheat, blackberry, roasted malt, yeast, and banana. Reddish brown with a thin, creamy tan head that leaves nice lacing. UPDATED: JUL 21, 2017 Tap at Beerdock Moscow. Muddy chestnut brown. Creamy head. Thick lacing. Aroma: smoke, moderate cheese & bacon, banana, spicy yeast. Medium body. Malty taste. Caramel, smoked malts. Medium sweet. Minor banana. Light bitterness finishing all. Pretty powerfull. The taste is not as complex as the aroma though.